The management of SOA composite revisions has been simplified to a check box and a number through FlexDeploy’s SOA plugin. Managing composite revisions historically required someone to develop and maintain a secondary process to purge unwanted revisions. Not anymore. Now just deploy your composite and let the FlexDeploy SOA plugin manage the revisions for you. Simply check the “Activate Purge On Deploy” input on the deploy operation, set the “Composite Revisions To Keep” property by environment and deploy. Once the composite is successfully deployed, the deploy operation will automatically purge any unwanted revisions based on the property value. 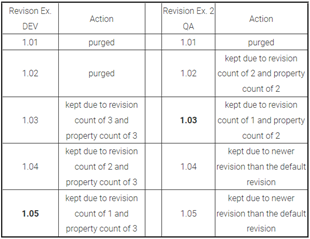 Candidate revisions for purge are determined based on the default revision and the environment property. The default revision is found and then the next oldest revisions are kept until the property value is met (this includes the default revision). For example, setting “Composite Revisions To Keep” to 3 in DEV and 2 in QA would have the following results (bold indicates the default revision): Read the complete article here.